Techcon Systems leads the industry in fluid dispensing technology. 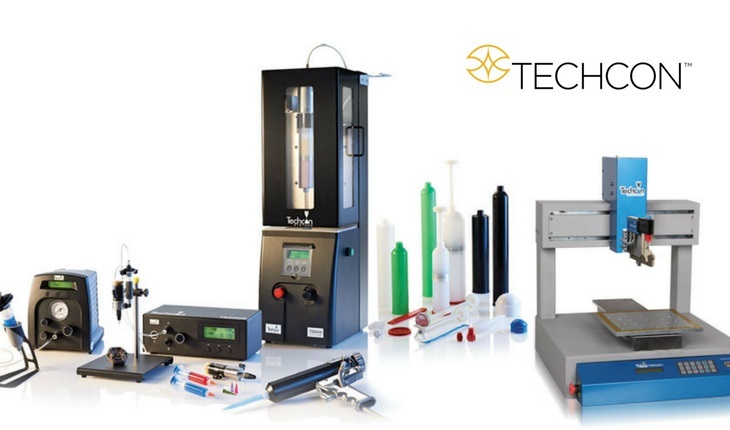 Techon fluid dispensers and components are designed and manufactured to provide strict control and accuracy for a variety of dispensing system applications. — April 2018 — Techcon is pleased to introduce the TSR2000 Series Smart Dispensing Robots. The system is designed specifically for precise fluid dispensing applications and is compatible with all valve types and controllers. The user-friendly, smart PC based software makes the robot easy to program and simple to operate. 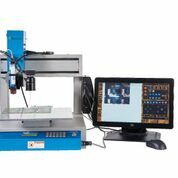 Smart features include intuitive software with touchscreen programing capability and CAD/DXF file import. The vision system allows the robot to automatically correct part misalignment and shorten programming time via its pattern recognition feature. The laser height sensor allows the robot to automatically adjust Z height to compensate for both surface height changes and part variation. From a general assembly manufacturer looking to automate an existing dispensing application, to an engineer designing a production process from the very beginning, Techcon Systems dispensing robots offer unsurpassed value in automated precision fluid dispensing. The basic Dispensing Robot series are available in three platforms. Uploud our Datasheet in Media folder: TSR2000 SDR or contact our Sales staff for further information.